Happy Birthday, Bagginses 2015, with new poem by jan-u-wine, art by Lee, Blakelock, Reeve. Happy Birthday, Frodo and Bilbo! ~ Bilbo Baggins, Esquire: two views, sketches by Alan Lee. ~ Bilbo Baggins by Daniel Reeve, prop drawn for Bag End scene in ‘An Unexpected Journey’. Another year, another anniversary of the Baggins birthdays. This year jan-u-wine’s mathom is ‘A Welcoming’, written for the occasion. I love this poem, understated and quiet yet suffused with a feeling of rising hope. The poem is set in Tol Eressëa, and Frodo is already feeling the effects of its balm, of sunrise and new mornings and freshness. I want to bury my face in it like an armful of new-cut apple blossoms. It's still the night under moon, but the reader can feel, almost see the growing light. 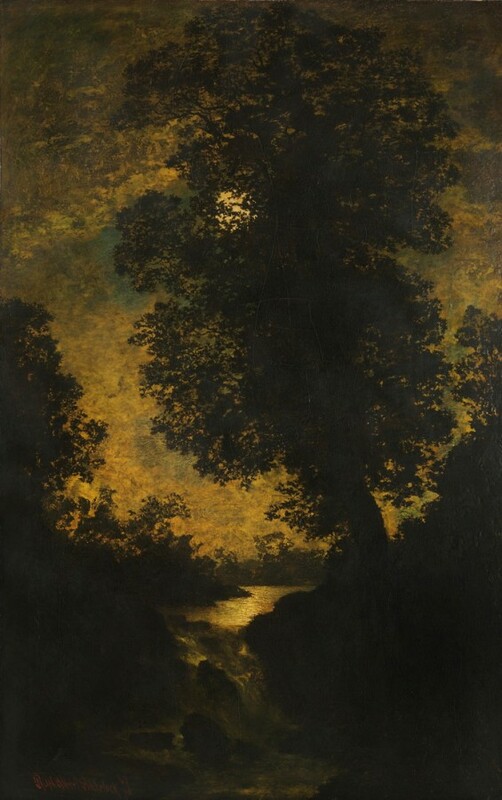 I chose Blakelock's painting of a creek at night, the moon radiant but obscured by branches, to suggest that sense. The drawing by Alan Lee below was made during the filming of LOTR and is my favorite Frodo portrait. For Bilbo I have posted one of my favorite pencil studies of pre-quest Bilbo by Alan Lee (done before the LOTR films), sensitive and subtle, and what is my favorite drawing of Martin Freeman in the role, a portrait sketch by artist Daniel Reeve that appeared among the props in Bag End in the opening of ‘An Unexpected Journey’. I love the “Bilbo-ness” it manages to capture, no histrionics, just straight-on, straight-up Bilbo. Raise your glasses, ladies and gentlemen, to the Shire’s finest (well, plus Sam). bespeaking a day of autumn’d fire. How grateful the heart which has missed them all. 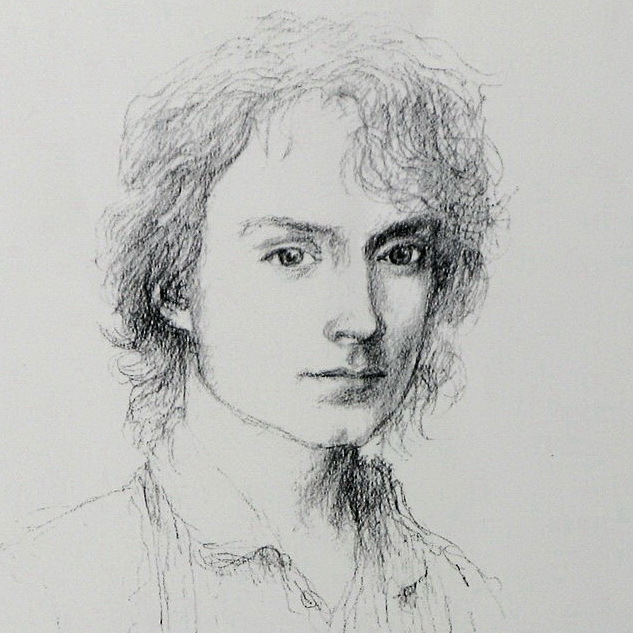 ~ Frodo Baggins, portrait sketch by Alan Lee. 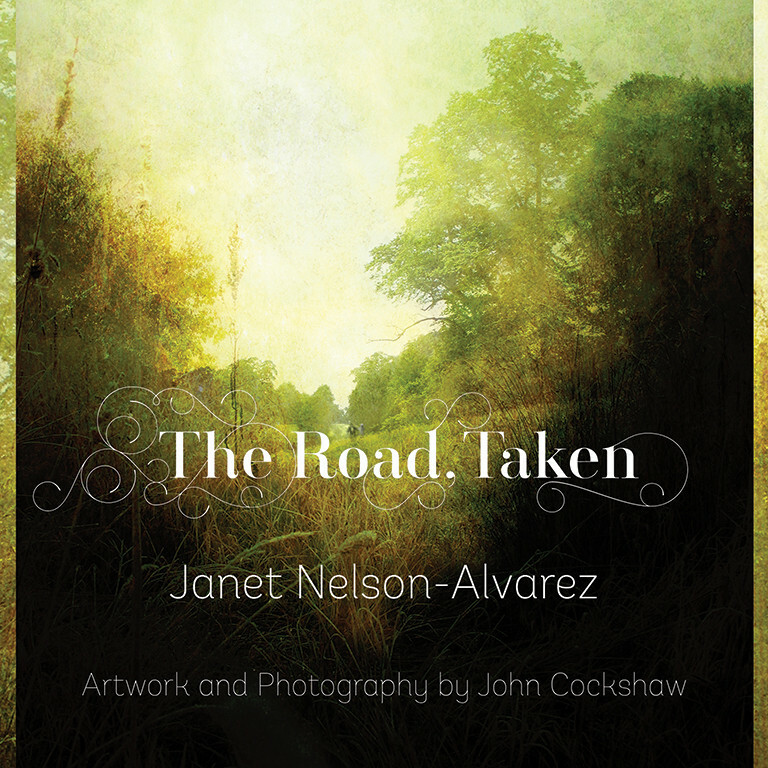 The Road, Taken, the book of poetry and illustrations that jan-u-wine and John Cockshaw have been working on for over a year, is now available for purchase on line. I’ve received mine and it’s absolutely GORGEOUS. Congratulations, Jan and John! Go to Oloris Publication’s page HERE. If you haven’t listened or watched before, get a luscious taste of The Road, Taken from this video John Cockshaw put together, linked HERE. Evocative music plays, John's illustrations moving across the screen, as he gorgeously reads excerpts from jan-u-wine's poems. It's a beautiful two minutes. 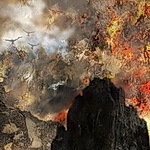 For more of John’s art, visit his website and lose yourself: From Mordor to the Misty Mountains: Original artwork inspired by the tales of Middle-earth . ~ For March 25, 2015: "The Turning of the Road: The Sammath Naur" and "Cast Up" by jan-u-wine, art by John Cockshaw. Happy birthday to our favorite hobbits !!! Lovely poem ! I really do like jan nu wines works ! I think that drawing was done for Lee's illustrated edition of "The Hobbit" which was published before he was hired to work on Peter Jackson's movies. 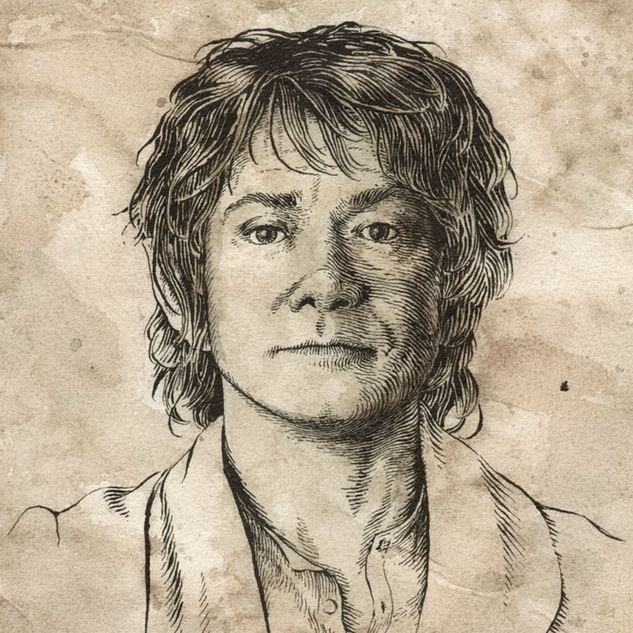 It's cool to see how a fine artist and Tolkien reader imagined Bilbo at fifty, still on the young side of hobbity middle age, and before everything he went through on his quest, a scholarly bachelor squire of good cheer with very good manners. :). A joyous birthday to our beloved Hobbits. As always.... a joy as well to see posts from you!!! Ah, Rakshi, thank you. It's a pleasure to post such a beautiful poem and works of art. Cheers to dear Bilbo and Frodo! Oh my. Gave me chills, as always. Thank you for sharing Jan's glorious poems and all of the wonderful art. As always, this post is a beautiful blending of words and images. 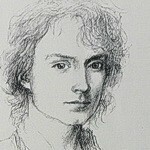 The Alan Lee sketch of Frodo shows him how I see him, fawn-like. The poem is melancholy and uplifting at the same time. I'll have to think a bit more about the last few lines. Is Frodo imagining he's back in the Shire or is this Sam speaking? (but I shouldn't be analyzing too much, just enjoy the words as I have been doing with the poems from "The Road. Taken"). So happy you both came here to remember our Frodo and Bilbo on their birthday. The sketches are so lovely. 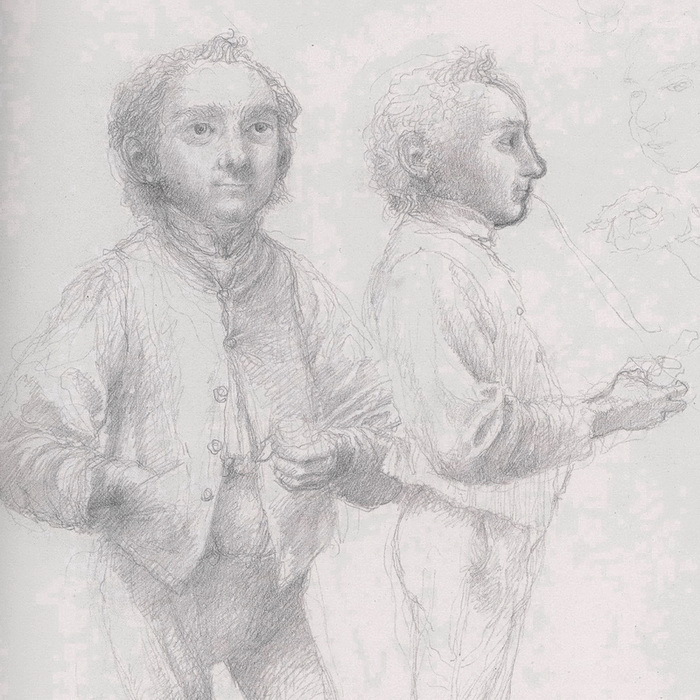 The face on "Bilbo Baggins, Esquire: two views, sketches by Alan Lee" resembles Martin Freeman's a bit, doesn't it? Was the sketch of Frodo done by Lee done before they cast Elijah in the role, do you know? The face on "Bilbo Baggins, Esquire: two views, sketches by Alan Lee" resembles Martin Freeman's a bit, doesn't it? Do you think so? Maybe the Lee drawings influenced the casting of The Hobbit, then. Lee's Bilbo sketches shown above were made before the LOTR films were yet conceived. They were for his illustrated version of The Hobbit, which came out before the trilogy, I forget which year. The sketch of Frodo by Lee was done during the filming. So if there is a resemblance, it is intended. Yet it is not slavish, not an exact portrait of EW as Frodo, which Lee could easily have done. I love its intelligence and sensitivity. When I look at it, "here is a person with keen, fine, gentle spirit, all at the same time." Lee's made the hair a bit more eighteenth century, too, which is the feeling I always had for the Shire when reading the books: an eighteenth century rural England in which the Industrial Revolution was not happening. My print of the drawing is a personal treasure of mine, given to me by a beautiful Tolkien fan from England, which she received, signed, by Alan Lee at an LOTR event. Because this drawing was done while he was working on the films it is not his property but the property of Weta/Jackson, which is why it isn't in any of Lee's own books or showings of his work. Dear Lord - how long has it been since I last commented here?! And congratulations on your publication, Jan! Re: Happy Birthday, Frodo and Bilbo! Hello, Diem! Yes, it does seem like a long while since we've 'met', doesn't it? But it is a greater loveliness, such meetings! Thank you very much; I'm quite excited about the book. It is very beautiful. And thank you for the compliment on this piece, as well. It's always such a pleasure to work with Mechtild. Such work is no work at all!!!! Just joy. If I may say so.....I think the world of Middle Earth and its characters stands in, for so many of us, for the world (and people) we'd like to see around us. we cannot stop loving them, we cannot stop celebrating what we wish was truly so. Yes, some people DO think we're crazy. But I think.....in this world, if you were NOT crazy you 'd be truly insane. (if you take my meaning). It's a good sort of crazy. It's crazy like the sun, like the flowers, like the depthless Sea. It's crazy like love, like music, like God. i was much in need of that when I started writing to LOTR. There is a timelessness and a depthlessness to it that eases sorrow. It is the joy that is like swords. So glad you enjoyed. I hope you've been well! 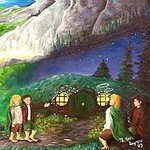 I so enjoyed the poetry , the art , and the commentary on today's birthday post for Bilbo and Frodo. As ever, the blend of these beautiful things creates an oasis of peace for those who see it. I really love Alan Lee, and I learned about Blakelock ( or at least a little bit about him), today . I always learn new things about artists here-- thank you, Met! And well-met is the choice of art, to illustrate the poem. Jan, your poem speaks of hope and peace, love and contentment. My favorite thing about this poem are the three sets of 3 (Like x3, Only x 3, How x3)... Sigh!!! How we humans love patterns. How comforting they are! Dear Anon! (aka Mary) ....I believe Met and I learn something new every time we post. I surely didn't know a single thing about Blakelock until we started looking at art for the post. I think Metchild didn't know too much, either. The one thing is.....it constantly hurts my heart, all the art we find that we must push aside as not being right for the piece....I want to write to those wonderful pictures, my heart singing along with the music of the brush.....but alas, it can not be. I must admit I love doing the "three" pairings. I often think about why it must be three....it must have a racial memory meaning for us all......two won't do and four is really too many. But three is just enough. There's a completness to it, somehow....(Met: The Power of Three, eh!?). Thank you so much, dear Mary. Because of you, I started writing LOTR poetry and continued along that path with Ms. (Hail Hobbit) Well-Met....thank you ladies, thank yoU! I am glad that Frodo is finding moments of discovery wandering his new home, the heaviness of thoughts turned away by beauty, and finding his return all the sweeter. This is such a lovely Birthday poem. I can shut my eyes and be there. The artwork is so well chosen to complement it. 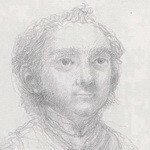 The pencil sketches have delicacy but strong spirit and seem timeless. Thank you dear mechtild and jan_u_wine, for more grace and beauty! Dear ASD....how happy it makes me that you read and enjoyed! I do very much like to think of Frodo (and Co.!) at last calm of spirit and happy and healed of heart. JRRT said, re Frodo's sojourn in the undying lands, that he'd been sent there to be healed, if he could, before he died. And there is no date of death given for him. Every day, when you think of it, IS a birth day. Every day we are born anew. Well, I am dreadfully late and told jan-u-wine I was too embarrassed to post here about this latest celebration of The Birthday, but she said you would like to hear from me anyway, so here I am. I love that art of Alan Lee's of Frodo's. I don't think I had seen it before. Love the poem of course and that interview she had with the TORN book club on Sunday. I so wish she will publish another volume of her masterpieces. While there's life, there's hope!! very glad that you enjoyed the post.....i love the pictures that accompany the poem. I have a copy of that Lee pic of Frodo....what wounded and fragile (and yet somehow depthless and determined) eyes he's got. I won't say 'never' about a secondary book.....just not sure at the moment how I might make that happen. Take care, dear Antane, and I hope that all will soon be well vis a vis your parents!